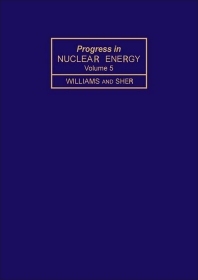 Progress in Nuclear Energy, Volume 5 covers the significant advances in several aspects of nuclear energy field. This book is composed six chapters that describe the progress in nuclear and gas-cooled reactors. The introductory chapter deals with the development and evolution of decay heat estimates and decay heat Standards, and illustrates the use of these estimates through comparison of both the actinide and fission product decay heat levels from typical fuel samples in a variety of reactor systems. The succeeding chapters present different practical methods for handling resonance absorption problem in the case of thermal reactor lattices and review the physics of the different noise phenomena. These topics are followed by discussions of the developed methodology for the description of breeding, conversion, long-term fuel logistics, and related subjects derived from the detailed mathematical description of the fuel cycle. The concluding chapters consider the historical development of heat transfer surfaces for gas-cooled reactors. These chapters also provide a complete set of differential nuclear data on the three technologically important americium isotopes, 241Am, 242Am, and 243Am, suitable for incorporation into the computer-based U.K. Nuclear Data Library. This book will prove useful to nuclear physicists and nuclear energy scientists and researchers.